Oodles and oodles of delicious noodles! Yup, that’s exactly what we have here today with this spicy soba noodle vegetable stir-fry! 35 minutes. Crisp tender veggie goodness. A super simple homemade spicy sauce. Crunchy cashews. Oh-so-slurpable noodles. 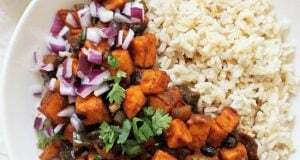 All joining forces in this easy, healthy and of course, tasty dinner! Now, important question. Are you on the soba noodle train? I’ll admit that I’ve been kinda sorta obsessed with them for ages. Which you probably wouldn’t even know considering I haven’t shared a recipe using them in over three years (soba noodle and pine nut salad anyone?!). The other really awesome part? They usually cook in about four minutes flat. And who am I to argue with that. Quick noodle-y goodness? Soba noodles, you jazzy little things you. Okay, I know I said this directly up above but I want to mention it one more time. If you are gluten free, please be sure to read the ingredients on your soba noodles as a lot of brands use some wheat flour in addition to the buckwheat flour. Pure soba noodles can definitely be found but it will just depend on what your store carries (ordering online is always an option!). Not feeling the soba noodles? No problem-o! You can absolutely use other types of similar shaped noodles in this stir-fry. Whole wheat spaghetti is a great alternative option. Let’s talk the sauce. With the full two tablespoons of sriracha, the sauce definitely has plenty of kick. I’ve also found that the spice level can vary a bit in different brands of sriracha – so just play around and find the amount that’s right for you! Once you start cooking, the stir-fry goes really fast. So this is one of those recipes where I’d encourage you to have everything prepped and ready to go before you start the cooking process. And finally! You could definitely bulk this pasta up by topping with a protein of choice. Customizable recipes for the win! Also … words I use in every single post when talking about noodles – oodles, slurp-able, jazzy. Don’t believe me? 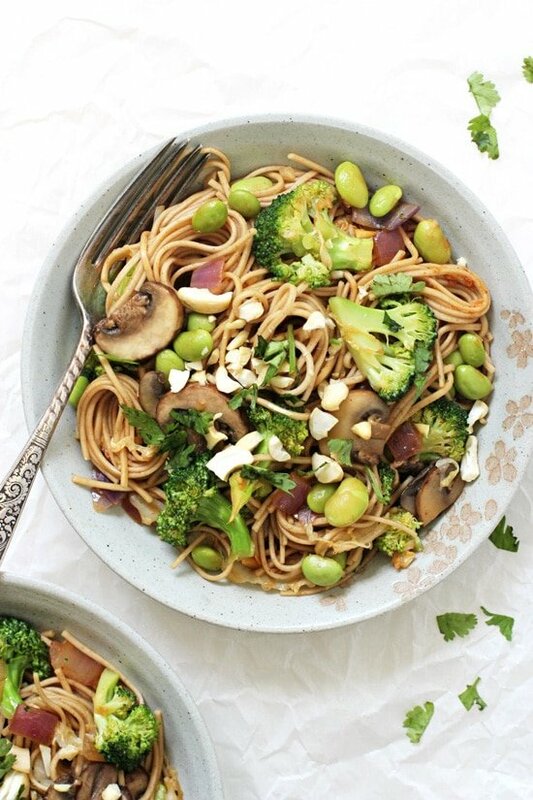 See this rainbow vegetable lo mein OR this spicy broccoli carrot noodle stir-fry. I think I have a problem. This easy spicy soba noodle vegetable stir-fry is a perfect weeknight dinner! 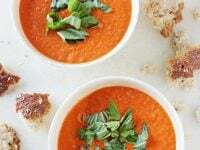 35 minutes, packed with veggies and an easy homemade sauce! Bring a large pot of water to a boil. Cook the soba noodles according to the package directions until just al dente (usually about 4 minutes). Drain, then rinse with cold water. Meanwhile, add the olive oil to a large nonstick skillet set over medium heat. When hot, add in the onion and cook for about 2 to 3 minutes, until it starts to soften. Add in the mushrooms and broccoli and cook for about 5 minutes, until the broccoli is crisp tender. Add in the cabbage and edamame and cook for about 2 minutes, until the cabbage has softened. Add in the drained pasta and the sauce. Continue to cook, tossing frequently, for about 1 minute, until everything is hot. Remove from the heat and garnish with the fresh cilantro and chopped nuts. Serve immediately! *If you can only find frozen edamame, add it to the skillet with the mushrooms and broccoli. You’re the best at creating healthy stir-fry dishes! Now this most definitely needs to be on the dinner menu ASAP! 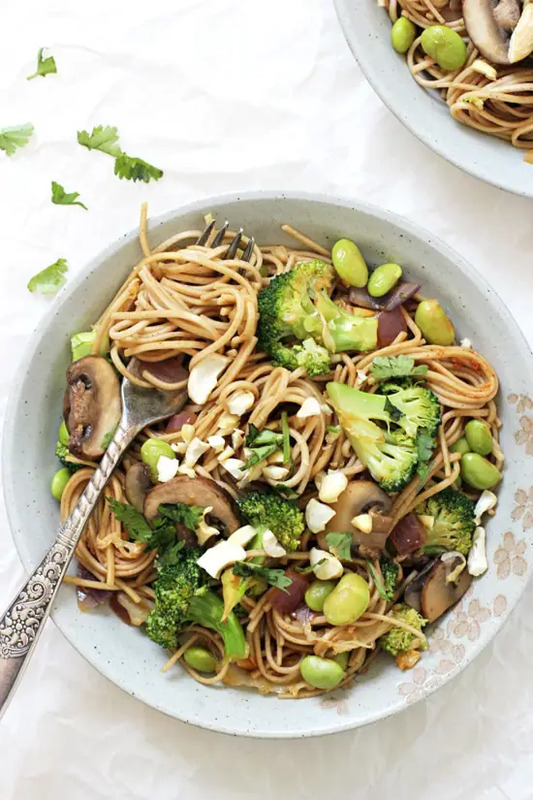 I’m obsessed with soba noodles and they seriously look AMAZING holding all that veggie stir-fry goodness! haha I was that way for so long! Now I keep them in my pantry pretty much at all times! Ooodles of noodles is just what I want for dinner! Such a great way to use soba noodles. I love the looks of this pretty dish! Perfect for dinner! I’m definitely riding the soba noodle train! I love them so much and they sound amazing in this recipe. That spicy sauce is everything! Love me some soba noodles, this stir fry looks perfect. I love dishes that are loaded with veggies! mmmm…fresh edamame..I want some! I love buckwheat but never buy soba noodles…I so need to change that! This meal is a great way for me to use up all the broccoli in my garden at the moment — it looks so good!